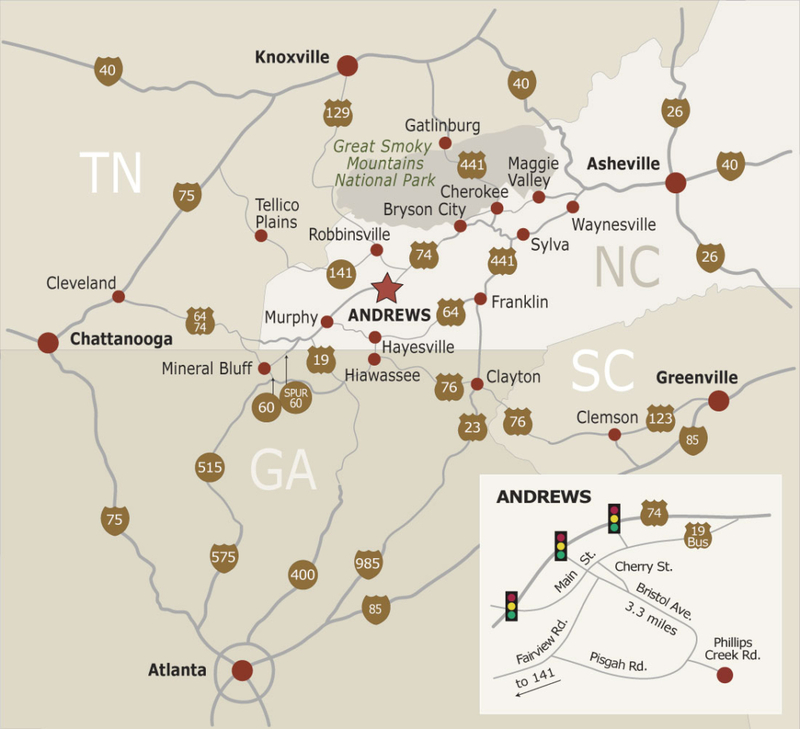 Andrews is located in the western corner of North Carolina in the Nantahala National Forest. We are 2.5 hours north of Atlanta. Andrews is a small town, but we do have a grocery store, movie theater, and liquor store as well as a variety of restaurants. Murphy NC is just 20 minutes away and offers more shopping and dining options, as well as the Harrah’s Cherokee Valley River Casino. The Western Carolina Regional Airport (KRHP), with a 5,500 ft. runway, is just four miles away. Rental cars available. 828-321-5114. Just past Hiawassee, right on GA-17/515 & NC-69 to US-64 at Hayesville. #1 – Not Recommended. Hwy 129 is an extremely winding road. Called “The Dragon,” it is loved by sports car and motorcycle enthusiasts for its 318 curves in 11 miles. Left .5 miles to sign.